After two years in development Julian Bakery is so proud to launch the first (non-gritty), gluten free, soy free, Vegan & Paleo, Pegan® Protein Bar that is made with 98% Organic Ingredients. This delicious protein bar is soft, creamy, delicious, ginger snap cookie taste with just the right amount of sweetness to truly satisfy your hunger and that sweet tooth at the same time. This yummy bar packs 20g of organic seed protein from organic Pumpkin Seeds that have a complete amino acid profile ideal for building lean muscle or aiding in your weight loss or maintenance goal in conjunction with exercise. 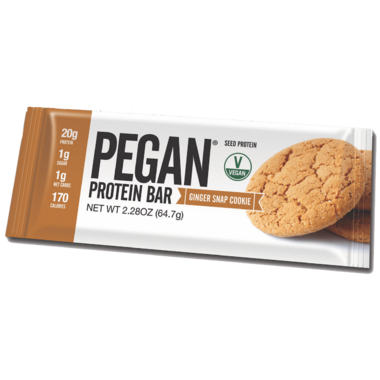 This Pegan® Protein Bar has 170 Calories, 1 Net Carbs (Almost All Carbs Are From Fiber) No Added Sugar Sweetened w/Monk Fruit and contains no sugar alcohols, corn, dairy or any junk. Every ingredient was hand picked to promote optimal health while still tasting amazing. Made In A Dedicated Gluten Free Facility (1 Net Carb) Kids & Adults Love! Ingredients: Organic Pumpkin Seed Protein (Seed Protein), Organic Digestive Resistant Prebiotic Fiber (From Organic Tapioca), Organic Sunflower Seed Butter, Organic Unrefined Virgin Coconut Oil, Monk Fruit (Lou Han Guo), Cinnamon Leaf Oil. Excellent taste, texture and portable nutrition! The ingredients in this bar are healthful and nutritious. The bars are high in protein and fiber, and very high in non-heme iron. Healthy bar, gave me energy and a nice taste of chai. Love the fact that they only use healthy ingredients. Great product. I really like the idea of this bar and really appreciated getting a sample. Lots of fiber and protein and no added sugar. I couldn't believe the nutritional information when I first read it. However, the name is misleading. There is NO ginger in the entire list of ingredients which explains why I certainly couldn't taste any! What I did taste is an overwhelming licorice/fennel taste (probably from the monkfruit as stevia tastes like licorice to me too) and then a strong bitter aftertaste like too much cloves (but was probably the cinnamon oil). I don't like it enough to try to acquire a taste (it might be better with strong coffee or tea) and it is very expensive for a single bar anyway. Really strong ginger taste in this bar. Not the greatest flavor. Very artificial-tasting and kind of bitter. I really enjoy them. They are chewy but the taste makes up for that. They are keto friendly so it is a nice treat with tea.